The Mewlon Series of Dall-Kirkham Telescopes by Takahashi combines refractor-like performance in a larger folded optic reflector design. The standard EM-200 or optional NJP mounts provide a stable, accurate platform for the M-210. The integral polar alignment telescope and R.A. axis level make accurate polar alignment to within 2 arc minutes of the celestial pole quick and easy. The reticle is designed to be used in either Hemisphere until the year 2030. 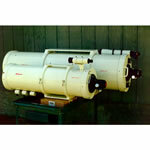 No other manufacturer uses such a highly accurate polar telescope. 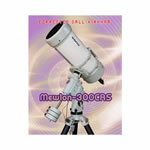 The Mewlon series of Dall-Kirkham Cassegrain telescopes from Takahashi offer the experienced observer a level of performance and portability not found in other Cassegrain telescopes mass produced for amateurs. 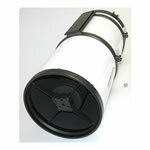 The classical Cassegrain telescope offers excellent performance, but they are extremely expensive to produce at large apertures. By concentrating on the Dall-Kirkham Cassegrains, the Mewlon telescope offers a professional level of performance within reach of most amateurs. The Takahashi Mewlon employs an ellipsoidal figure on the primary mirror and a spherical figure on the secondary. By focusing on very tight tolerances for these surfaces, Takahashi is able to deliver a compact telescope with reasonable aperture and high resolution. Where fast F/ratios are not required, the F/12 Mewlons provide excellent contrast by utilizing a smaller secondary mirror than comparable Cassegrain designs. Secondary obstruction as a percentage of diameter is 29-31% on the Mewlons. Classical Cassegrain telescopes usually have secondary obstruction of 32% or greater. Commercial Schmidt-Cassegrains have secondary obstructions of approximately 38% for F/10 systems. Ritchey-Chretien Cassegrains have even more secondary obstruction making them less suitable for visual, high contrast applications. Takahashi uses extensive knife-edge baffling to minimize stray reflections as well as a specially designed tube that also acts as a light baffle. 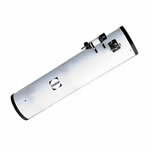 The result is an instrument that rivals an excellent long-focus Newtonian or refractor for contrast and sharpness. Some opticians have criticized the Dall-Kirkham design as having unacceptable coma. With most eyepieces (including Panoptics and Naglers) the coma is negligible and well outside the field of view. Stars are much smaller and sharper than in commercial Schmidt-Cassegrains. Coma may be a problem for wide-field astro-imaging, but these instruments were not designed for such tasks. With Takahashi's field flattener/reducer, these instruments offer superb off-axis images at F/9. Takahashi produces precision optical surfaces capable of delivering an airy disc of 20. Because the Mewlon primary mirror is larger than the effective aperture, its cell installation engineering helps to eliminate mirror stress which can cause astigmatism. The focuser mechanism has also been carefully designed to reduce shifting and maintain consistency. Both the Mewlon 250mm and 300mm models come standard a secondary mirror translating focuser that's accomplished with the electronic hand controller. 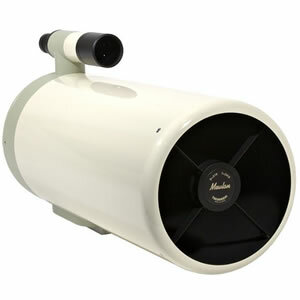 With a wide range of both visual and photographic accessories available to the Takahashi Mewlon series, there is no reason why you shouldn't be able to achieve any astronomy project you have in mind using this fine telescope. The 250mm and 300mm Takahashi Mewlon electronic focusing is accomplished by moving the secondary mirror. This eliminates the image-shift problem inherent to commercial Schmidt-Cassegrains with moving primary mirrors. 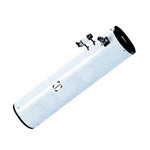 Because of the loose tolerances required in moving large and heavy mirrors on a baffle tube, most SCT's will not maintain perfect collimation. Image quality is then compromised in such optical systems. The large Mewlons also have removable covers for their primary mirror cells, this facilitates rapid mirror cooling so that the observer can take advantage of favorable seeing conditions more quickly. 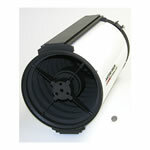 These features make the large Mewlons ideal for high-resolution CCD imagery. With the Mewlon series, it isn't necessary to sacrifice optical performance for ease of use and portability. When it comes time to place your Takahashi Mewlon telescope on a mount, it's as easy as simply connecting the dovetail plates. 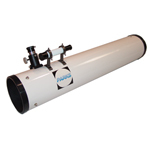 The high quality finderscope not only lends itself to the packages as an excellent instrument for alignment, but is also designed as a convenient "grab handle" to assist in mounting and transport. It's rigid construction means help in handling the optical tube without fear of bending or breaking. On larger models, the Mewlon also includes a counterweight against the body to help balance the optical tube. Just these small considerations in Takahashi's Mewlon design mean quality in engineering that sets it apart. The 8.3" Mewlon 210 weighs just 18lbs (8.2kg) with a 7x50 finder attached. 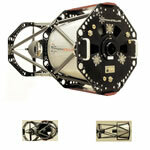 The Mewlon 250 weighs only 28lbs (12.7kg) and is remarkably compact for a 10" Cassegrain. 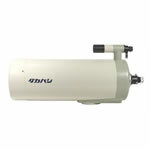 Both of these instruments are highly portable and offer deep sky views that are exceptional. On the planets, many observers have reported seeing details they thought impossible with telescopes of this aperture. With the exception of a few diffraction spikes around bright stars, on might believe they were observing with a large apochromatic refractor. The advantage, though, is a greater amount of light grasp and resolution than a comparably priced refractor. Indeed, the Mewlons offer an exceptional value in their aperture class. So if you desire a professional grade instrument in a compact, lightweight package or are tired of compromising light grasp for crisp detail and contrast, check out the Mewlon Cassegrains by Takahashi. You will be pleasantly surprised by their performance. 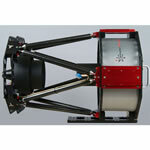 Dall-Kirkham Telescope combines refractor-like performance in a larger folded optic reflector design. The Takahashi Mewlon 210 at prime focus provides a focal length of 2415mm, focal ratio of f/11.5 and image circle of 18mm. Primary mirror diameter measures 220mm (f/2.9) with a secondary mirror amplification of 65mm (4X) and secondary obstruction of 0.32 (31%). The Takahashi Mewlon 210 measures 700 mm long, 244 mm in diameter and weighs 17.6 lbs. (8kg). It offers a limiting visual magnitude of 13.4 and a light grasp of 900x - providing an outstanding resolution factor of .55 arc seconds. The Takahashi Mewlon 210 with optional reducer can achieve a focal length of 1961mm, focal ratio of f/9.3, image circle of 39mm and a 1.2 degree image field.